How many? How long? How much? Those three questions dominate the public days at LEGO conventions. It is the Holy Trinity of LEGO questions. They are repeated on an almost endless loop by visitors as the oogle the sculptures and Town & Train displays. I watch as Adult Fans of LEGO gracefully deal with repetition. As the crowd shuffles past, many will often stop and their first instinct is to touch a display. 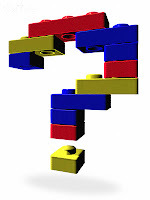 After that, the questions usually follow... How many pieces are in what you built? How many pieces are in your collection? How long did it take you to build? How long have you been collecting LEGO pieces? How much does all of this cost? How much have you spent on LEGO in your life? Brian Darrow, who has built the 34-foot-long Blacktron Intelligence Agency, apparently uses a FAQ (frequently asked questions) to try and let people know how long it took to build his expansive space vignette. For the other AFOLs, it's an exercise in patience and a chance to talk about what they have constructed. Oh, wow. That is scary cool. That is almost as obsessive as the guy I read about many years ago who built a building behind his house as big as his house. It housed his model railroad. Hey, a Lego house could be built to house a Lego collection.